‘Essence of Ramayana’ was the theme of the two day Jnana Yagna conducted by Acharya Bodhatmananda-ji on May 6th and 7th. The session began with chanting of Bhagawad Geeta Chapter 17, followed by mesmerizing Lord Rama and Krishna bhajans sung by the Swaranjali group. 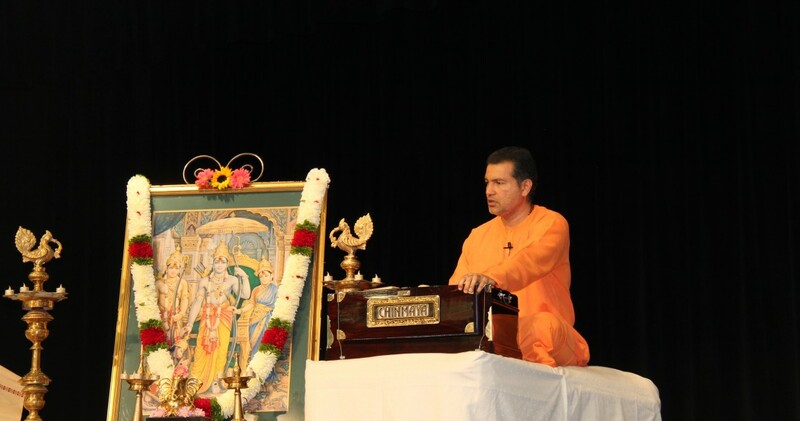 On the auspicious day of Mohini Ekadashi, May 6th, Swami Bodhahtmananda-ji inaugurated and unveiled Chinmaya Mission Balvihar Program in San Mateo, the fourth Chinmaya Mission Balvihar center in the Bay Area serving the expanding Mission community. A captivating 2 day discourse with our beloved Swamiji before he left for India was another blessed opportunity and a delight for the Bay Area community. The discourse on Rama Geeta took place in an equally enchanting setting of Panchvati forest between a perfect guru, Sri Rama and an ideal qualified disciple, Laxmana. The two have a dialog where Laxman-ji asks about knowledge, dispassion, maya, bhakti, creation and Jeeva-Iswara Bheda. Sri Rama responds briefly on each topic starting from the disease called maya and then answering the remaining questions one by one, briefly yet with immense clarity, providing the cure in the form of jnana. The evening commenced with melodious bhajans by Swaranjali children, followed by a captivating video presentation of the centers, activities and growth of Chinmaya Mission San Jose. The presentation beautifully summarized how the mission grew from a handful of Balavihar children to serving more than 2,000 children across three Bay Area locations. The center has been blessed by many great Resident Acharyas, including Swami Tejomayananda ji, Swami Nikhilananda ji, Uma Aunty, and most recently Swami Bodhatmananda ji. Under their humble guidance, and selfless dedication of hundreds of mission volunteers, Balavihar sevaks/sevikas, Yuva Kendra groups and countless parent helpers, CMSJ has continued to grow and flourish many folds. After a brief recap, Swami Bodhatmananda ji captured all hearts with his talks. He elaborated on the teachings of Lord Rama, in response to questions posed by Laxmanji – about what was Maya, Jnana, Vairagya, Jeeva, Ishvara, and Bhakti. Swamiji clarified that Maya constitutes the major part of dialogue, as once Maya was understood, other questions became easy to grasp. ​Maya is the disease and knowledge is its remedy. Swamiji explained about Maya in its gross and subtle expressions, also went on to describe its two-fold nature of Vidya Maya and ​ Avidya Maya​. ​Avidya Maya is ignorance and false notions – where I take myself to be something other than what I truly am. Jnana (Knowledge) is that where there is no wrong idea about myself and I only see oneness. Vairagya (Dispassion) was the ability to give up anything anytime. With the clarity of knowledge, dispassion becomes supreme. Jeeva is the one who is ignorant about three things – Maya, his true identity and Ishvara. Once Jeeva knows his true identity, there remains no difference in him and Ishvara. Finally, Swamiji expounded on devotion as one that touches Lord’s heart. Requiring no preparation, devotion purifies the mind, strengthens one’s dispassion and abidance in knowledge. Love for teachers who dwell in the essence of Vedas, selfless performance of one’s duties as an offering to Lord, listening, remembering and singing His glories were some of the qualities of a devotee. In such a pure and divine heart of a devotee, Lord ever rests and revels in His glories. With his clarity and vast knowledge of scriptures, our Swamiji once again made the teachings so simple and easy to grasp, touching all hearts, filling them with Light and reminding us again the true purpose of our existence. Our heartfelt gratitude to the Guru-Shishya Parampara for another enlightening Yagna!